Welcome to Will-n-Essie's Toybrary of Center City Philadelphia, our original Toybrary! This Toybrary was made possible thanks to generous grants from William Carey and Francis Carey of the W. P. Carey Foundation, a beautiful space donated by The Church of the Holy Trinity, toy purchasing discounts offered by local retailers, and of course the exciting new toys donated by our Toy Industry Sponsors. We are proud to be Philadelphia Magazine's Best of Philly� - Toy Source 2007. Our dedicated team of Toybrarians and volunteers strives to foster a friendly atmosphere in which children feel welcome and parents feel encouraged and supported. We invite families from the greater Philadelphia area to discover the wealth of resources and fun at Will-n-Essie's Toybrary, the place to check out toys! 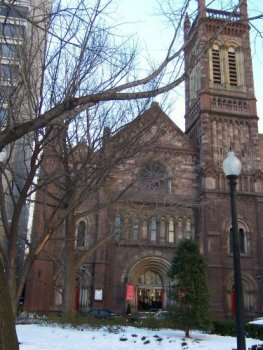 The Church of the Holy Trinity, corner of 19th and Walnut Streets. Please enter via the stroller-accessible ramp on 19th Street. Strollers can be parked in the sanctuary. Signs will direct visitors to the third floor of the Parish house. Click here to join Will-n-Essie's Toybrary using Paypal! Philadelphia's Toybrary offers a special membership program for Wharton Kids Club families wishing to join at the "Blue" level. Click here for details.